The popular Brazilian artist Binho Ribeiro was born Fabio Ribeiro and started painting in 1984 and is now credited as being a pioneer of graffiti art in both Brazil and South America. When Binho Ribeiro was just twelve years old he decided to start using the painting and drawing skills that he learned in school in order to express himself through graffiti art. He met a number of other local graffiti artists such as Os Gemeos and Speto quickly started to develop his own style. 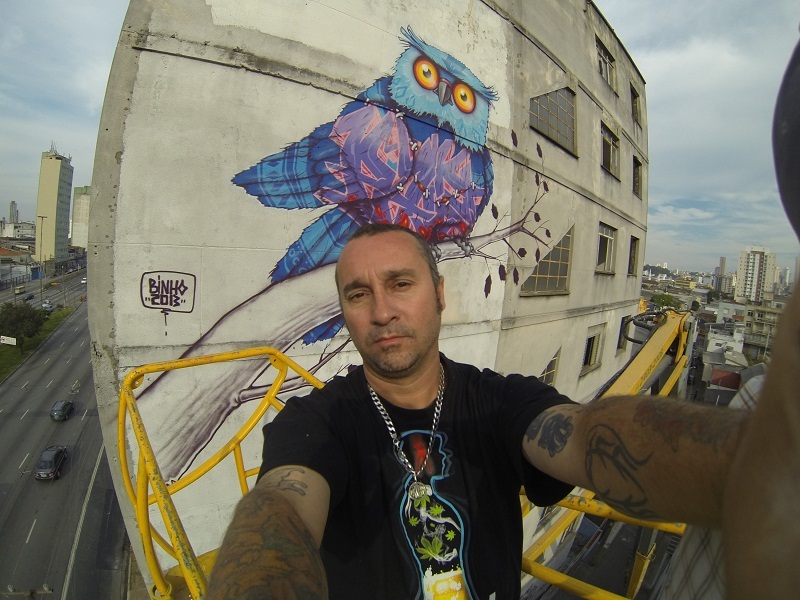 Binho Ribeiro uses graffiti art to express his love for modern culture, particularly hip-hop music. Among his most popular characters are stylized animals like monsters w earing gas masks, coy carp, and unique hip-hop turtles. Although he regularly sends his artwork to galleries and collectors all over the world, Binho Ribeiro has not forgotten his roots. While his stylized gallery artwork pays the bills, he can still often be seen creating street work for the general public to admire. In addition to the streets and popular culture, Binho Ribeiro’s other influences include Brazil and the Far East. These dual and extremely divergent cultures have led to an interesting duality in the artist’s work that has given it a unique and extremely appealing quality. Above all, Binho Ribeiro has commented that he likes to have fun with art and experimenting with different styles. This love for fun gives the work a fresh quality and ensures that it is as interesting to the artist as it is to his admirers. These days Binho Robeiro still paints every day and travels a lot, both for work and pleasure. He is also the curator of the biennial Graffiti Fine Art exhibition, which is held at the Brazilian National Art Gallery. Binho Ribeiro has also taken part in a number of high-profile art projects in recent years, including directing the artwork for Madonna’s Superstar promotional single.